The Class of 2018 will be celebrated Monday, May 14, at Emory’s 173rd Commencement, which will feature a keynote address by Emory alumnus Michael Dubin, trailblazing entrepreneur and co-founder and CEO of Dollar Shave Club. As the sun rises, a crowd of about 15,000 guests will begin assembling on the Emory Quadrangle for the morning ceremony, which opens with a grand academic procession led by a pipe and drum band, with students marching in from all four corners of the Quadrangle, and concludes with the collective conferral of degrees. The exercises will be steeped in time-honored ritual and pageantry, including an array of colorful academic regalia, formal remarks by President Claire E. Sterk, a keynote address by Dubin, and the presentation of honorary degrees and awards. The central ceremony begins at 9 a.m., followed by diploma ceremonies for individual schools in designated locations. Emory College of Arts and Sciences graduates will remain on the Quadrangle for their diploma ceremony. During her remarks, Sterk will acknowledge the wide-ranging accomplishments of Emory’s undergraduate, graduate and professional students, a new generation of graduates recognized for their scholarship, community engagement and global outreach. The Class of 2018 includes 4,902 expected graduates from across the nine schools that make up Emory University. A total of 4,994 degrees — including 92 joint degrees — will be conferred upon students from 52 U.S. states and territories and 103 foreign countries, according to preliminary statistics available May 9 from Emory’s Office of the Registrar. This year’s keynote reflects a story of remarkable commercial success. Dubin, an Emory alumnus, is widely recognized as a creative entrepreneur, executive and brand-builder. During Monday’s ceremony, Dubin will receive an honorary Doctor of Letters degree — among a series of special awards and recognitions that will be presented to students and faculty. 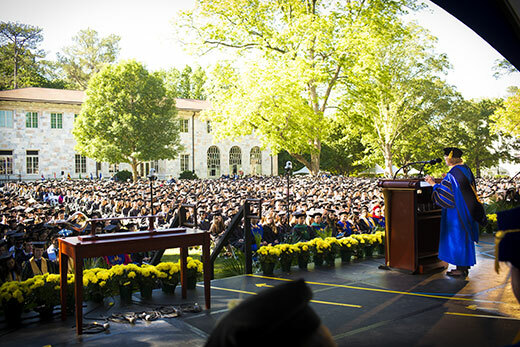 For a complete schedule of Commencement events, including plans for individual school ceremonies, visit the Emory University Commencement website. Can't attend the ceremony? The 173rd Commencement exercises will be streamed live online.